Main Street Vancouver has gone tree crazy. As one of Vancouver’s most eclectic and vibrant shopping districts it is not surprising that they have launched a colourful new holiday tradition called “Get Your Tree On.” Forty merchants along Main Street have joined forces to decorate Christmas trees and are inviting shoppers to vote on their favourite and enter into a draw for one of two amazing gift baskets. 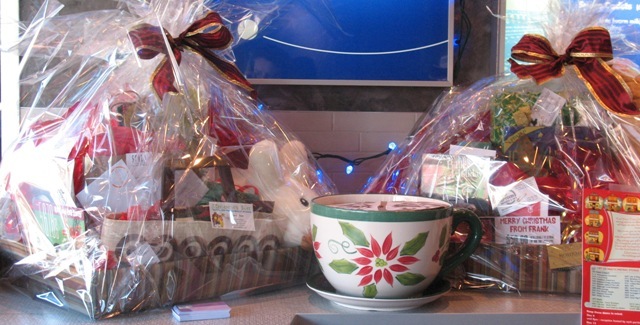 Each store has contributed either a gift certificate or product from their store towards the gift baskets, making each basket worth just over $1000…definitely making it worth while to head over to Main Street this week and to vote for your favourite tree. Shoppers can vote either online at www.shopmain.ca or at a ballot box located at Re-Entry Espresso (4363 Main). Voting will be open until December 12th at 12 noon. Flyers with a list of all the tree sites, and a ballot, are available at each of the participating stores. The draw will be held at 2pm on December 12th at Once a Huckleberry Bush (4387 Main Street) along with a performance by the Vancouver Children’s Choir. There will also be food boxes in each of the participating stores collecting donations for the food banks at St. Michael’s Church on Broadway. Each tree is quite different and appears to reflect the personality of the store along with its owners. 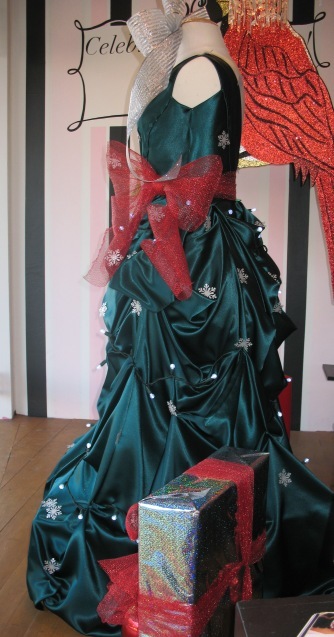 Bodacious (shown above) has showcased a stunning green “plus size” gown as their tree and and in similar fashion, Solid Threads (3851 Main Street) has decorated a mannequin in a vintage green dress as their entry. 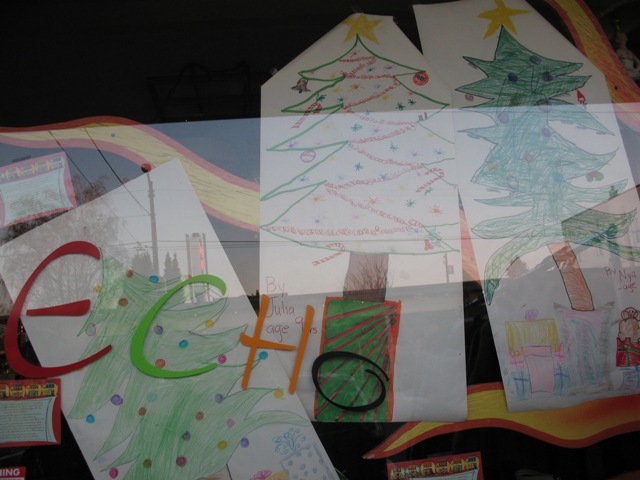 Echo Unique Resale (3553 Main Street) has gone a very different route and had children (and some adults) draw pictures of trees. The drawings are very sweet and offer a unique approach to this competition. 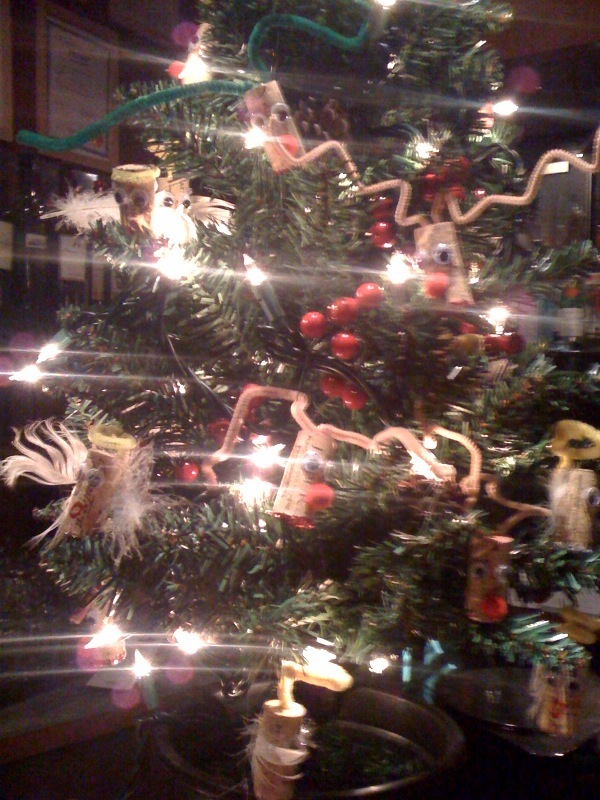 Down the road, Public Lounge has also enlisted the help of children and had them make tree ornaments out of wine corks to look like reindeer and angels. They were done by children in the after school program at the Mount Pleasant Community Centre. Vintage trees and ornaments were also popular for many of the store owners. 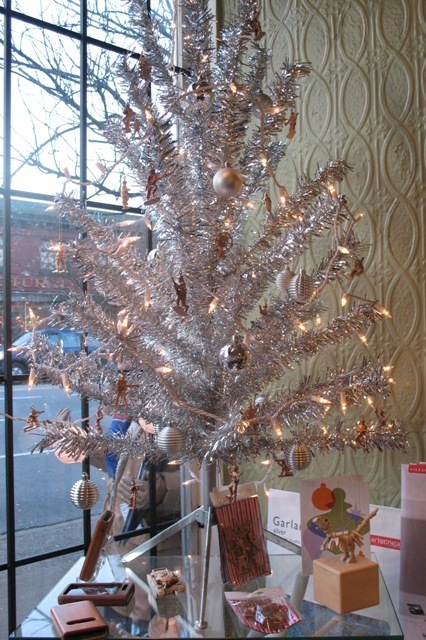 Laura Frederick from Dandelion Emporium used a vintage “tinsel” tree from the 1960’s and decorated it with gold army men ornaments made by local artist Laura Skuse (Exskuse Design). The tree is standing on the Branch Table by designer Harry Allen. Neptoon Records and CDs also used some classic vintage ornaments on their tree and Sellution Vintage Furniture (3206 Main Street) put their unique spin on things by using antique tea cups, broaches, and silver as decorations. The spirit of giving was also an important theme for some stores. 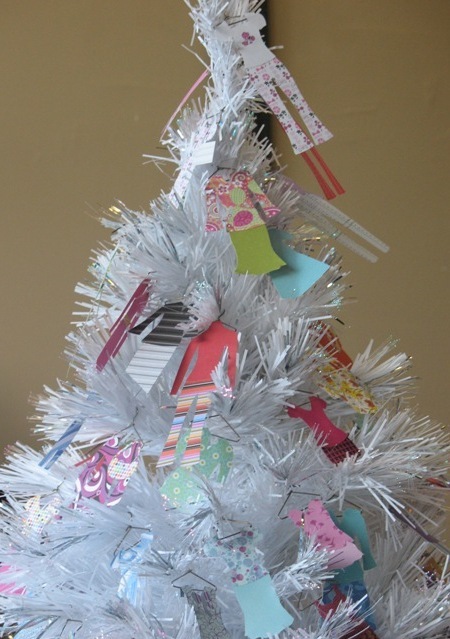 Bohemia Gallery/The Loft decorated their tree with warm mittens, gloves, hats and scarves…all of which will be donated to St. Michael’s church to support families in need. Two of Hearts Clothing (3728 Main Street) had local designers create ornaments for their tree and are all for sale with 100% of the purchase supporting the Adoptive Family Association. Yummy treats also made their way on to a few trees. 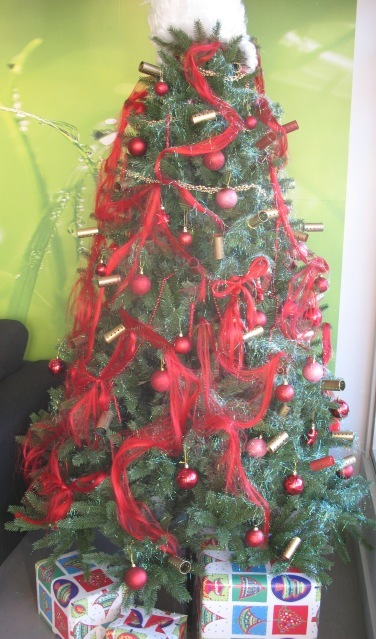 Tina Teoli from Miranda’s Hat (3860 Main Street) decorated her tree with candy…and with each purchase shoppers get to grab a piece from the tree to take home. 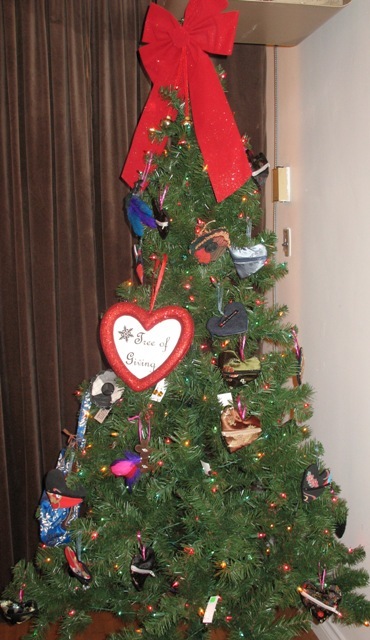 In a slightly different approach, the tree at Life of Riley (3697 Main Street) had dog biscuits attached with red bows. Artistic expression featured well throughout all of the trees. Barbara from Plush used beautiful green fabric to create her tree while artists from Arts Off Main designed their own decorations to reflect their art being sold in the shop. The tree on display at Body Politic also showcased handmade ornaments by local designers and the tree at Scala was decorated with paper cut outs, all individually created. Kiddo Consignment was also quite clever with their tree…they used white hangers to create the silhouette of a Christmas tree. Although all the trees were beautifully and thoughtfully decorated, and I am sorry that I couldn’t list them all here, two stand out for me a bit more than the rest. 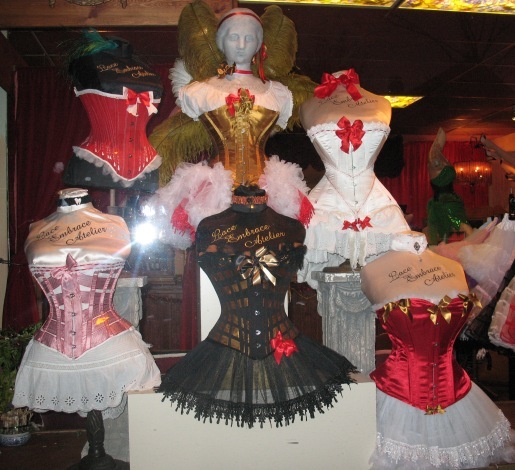 I was pleasantly surprised when I walked into On The Fringe Hair Design and saw that they had used red hair extensions as tinsel and gold hair rollers as ornaments…but even more captivating was the “corset tree” that was on display at Lace Embrace Atelier…a very provocative approach indeed! I noticed the most wonderful sign this morning – Free Ski and Snowboard Boots! It wasn’t in a laneway but rather at a local sports consignment store called Cheapskates. They seemed to have a terrific selection of all types of sizes and makes. Definitely a great find for anyone wanting to learn to ski or snowboard this season. This way you can save some money on the boots while being able to rent the rest of the gear. Also, I have learned that by putting money into a pair of inserts, that can make any boot work. Barry has been a sports enthusiast most of his life and after having accumulated excessive amounts of sports equipment, he decided that there had to be a way to recycle and resell all of it. He had previously been in the real estate business but decided to start his own sporting goods business after he had swapped a house in Gibsons for a storefront business in Vancouver. Times were different back then, people bought secondhand because of necessity and it was not as socially acceptable to purchase used goods as it is today. Barry remembers one woman who came from across town to buy used equipment for her kids and liked that it was out of the way, none of her friends or family knew that she was buying things secondhand. But he also started the business at a time when recycling was becoming more prominent. And this changed everything. After a few years in business he outgrew the first storefront location, but instead of going after a larger building he decided to open up a second store and split up the different kinds of sporting equipment. This led to Cheapskates Too at the corner of Dunbar and 17th, and two years later Cheapskates Fore a few doors down, and finally Cheapskates 19 at Dunbar and 19th. The stores evolved into departments, each with its own specific type of inventory: Cheapskates 1 -skating, hockey, soccer, baseball and exercise equipment; Cheapskates Too -bicycles and parts; Cheapskates Fore -golf, racquets, and inline skates; and Cheapskates 19 -skis, snowboards, snowshoes, camping equipment, and ski clothes. This allowed Barry and his staff to keep better track on the inventory and to become very knowledgeable in each area. 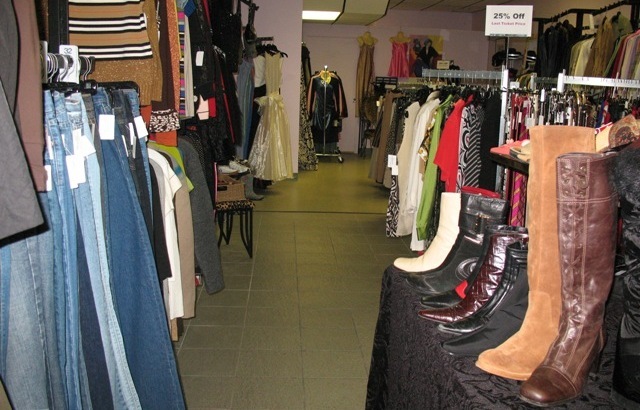 Everything is sold on consignment, and the prices are discounted over time. Barry also made a decision in the beginning to only mail out the cheques so as to discourage people from trying to sell stolen merchandise. He currently has thousands of consignees who cover a large geographic area including the Kootenay’s, Vancouver Island, Lower Mainland, and even the U.S. And he has a very diverse client base. He has also made a strong commitment to the community and has created a unique way of donating to charity. He has a wonderful system in place where people can drop off used sports equipment and then have the proceeds of the sale go to a charity of their choice. He currently has accounts set up for the Boys and Girls Clubs, Amnesty International, KidSport, Heart and Stroke Foundation, Junior League Sunshine Wheels, and the Hearing Impaired Foundation. But he can also arrange to send the money to different charities if you provide him with all the necessary contact information. Bohemia Gallery (3243 Main Street @ 16th), one of Vancouver’s best kept consignment store secrets, welcomes local designer Karen Green, from ODP Designs, to The Loft. Jann Purcell, Bohemia’s owner, is thrilled to showcase ODP Designs and passionately believes that Karen’s designs are a perfect fit with her belief and life philosophy that “fashion is art”. Karen’s designs, all one-of-a kind pieces, are reconstructed from recycled clothing and fabric and reflect her love of all things unique and beautiful. Knowing no boundaries, Karen’s designs create cultural connections by mixing fabrics and fusing them in the most unexpected and exciting ways. Karen started designing her own clothing at an early age and created her own distinctive look – first for herself and then for her children. Eventually her passion for fashion led her to start her own fashion line – ODP Designs. With the loving support of her family, Karen has grown her fashion line to include everything from reconstructed sweaters and kilts to beautiful wedding gowns that are crafted from a unique multi-cultural mix of fabric. This past week, Karen and Jann joined forces to host their first fashion show in the Loft, upstairs in the Bohemia Gallery. It was an incredible success with over 200 people in attendance. Jann showcased vintage fashions and clothing from the late 70s and early 80s, reminding us that what is old is definitely new again. The models (both men and women) presented a visual feast of bright colours with shiny gold accents as accessories (everything they wore came from the store). Their silhouettes were framed by striking hair pieces. Karen’s models (again both men and women) on the other hand were more muted in colour, but vibrant in layers of texture and fabric. All of her designs are unique and can best be described as Victorian Romanticism meets the streets of Vancouver. From everyday wear to Celtic inspired wedding gowns and stylish kilts and sweaters for men, her clothing not only blends texture and fabric but various fashion eras as well. The evening was both festive and fun. I look forward to their next event, as I am sure it won’t disappoint.